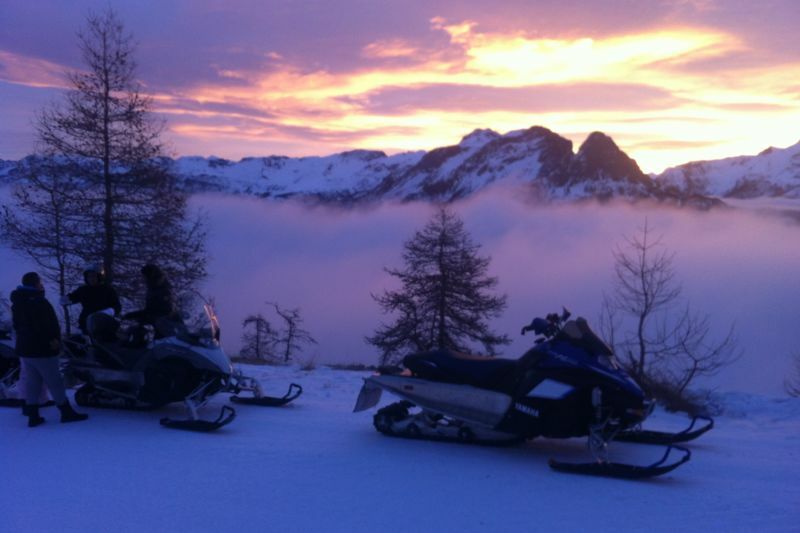 From dawn, price in hand of your snowmobile, leave in the middle of nature to offer you a total, unique and relaxing change of scenery and thus start the day of the most beautiful possible ways. Improvisation of a breakfast in the heart of nature, with the sunrise as a sublime show! Your safety is guaranteed by our experienced guides. The start is at 7:30 am at the bottom of the slopes after a briefing of 15 minutes. The walk lasts one hour, during which we will have a breakfast break while admiring the magnificent sunrise on the Mercantour massif. The return is made at the bottom of the tracks at 8h45. Departure only Wednesday, Friday and Sunday (Until mid March). Two minimum snowmobiles are required for the departure to take place. Provide warm equipment (ski-wear type, gloves, warm shoes). Possibility of passenger behind the guide from 8 years (to see on the spot). 1.45m minimum for the passenger. 18 years old, license holder B. Mandatory security deposit: € 1,500 per vehicle (borrows CB only). Please arrive 15 minutes before the start time of the hike.